The faith-based film Breakthrough (PG) opens April 17, telling the real-life story of a mother who wouldn’t give up on her son when his heart stopped beating and when doctors said he had no hope of recovering. 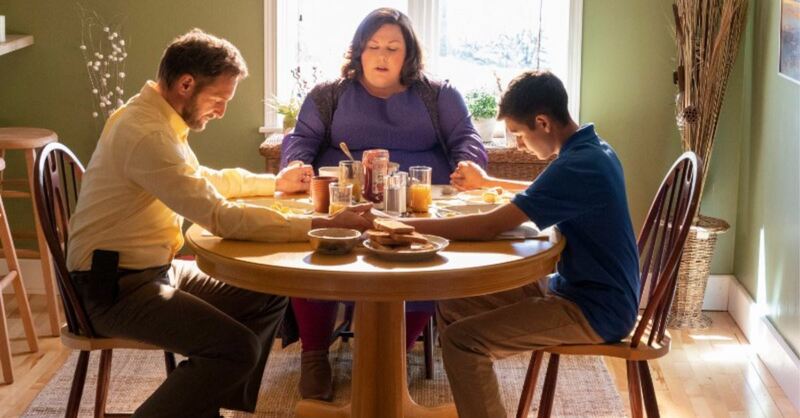 It stars Chrissy Metz (This Is Us) as the mother and was produced by DeVon Franklin (Miracles from Heaven, The Star). Roxann Dawson (House of Cards, This Is Us) directed it. Joyce Smith is a loving mom who would do anything for her 14-year-old son, John. But John is pushing back against her love. Maybe that’s because he’s a teenager. Maybe that’s because he’s struggling with his identity in life as an adopted kid from Guatemala. Or maybe that’s because she won’t give him any space. Whatever the reason, their relationship isn’t what it once was. John falls through a frozen pond and is pulled up without a pulse. He is transported to the hospital, where doctors and medical professionals try reviving him with CPR and shock treatments. It fails. For 45 minutes, he has no pulse and no sign of life. Until, that is, his mother prays – and his heart starts beating again. Breakthrough is among the best fmovies I’ve seen. It’s also among the most inspiring. Perhaps that’s not surprising, though, since Metz – who plays the mother, Joyce Smith – is a two-time Golden Globe nominee for her role in NBC’s This Is Us. Her acting abilities are on full display: from grief to fear to anger to joy. The film’s most emotional moment takes place when she’s praying and crying over John’s lifeless body, but she’s just as impressive in other moments. Director Roxann Dawson, who has directed Metz in This Is Us, said Metz is “chameleon”-like with her ability to play different roles and emotions. “She is one of the bravest actors I've ever worked with,” Dawson said, referencing the emotional moments in the film. “It's very difficult to do what she did and to go to those places. … She's just such an amazing talent.” The film’s other talent is impressive, too, including Topher Grace (Spider-Man 3) as Pastor Jason Noble and Dennis Haysbert (24) as John’s doctor. Dawson is experienced at filmmaking, and it shows. The film’s song choices are perfect, too. Breakthrough may make you cry (a woman behind me was sobbing), but you’re just as likely to want to run home and give your loved ones a hug. It’s a movie that celebrates some of God’s greatest gifts – life, children, family, friends, faith and the church – while spotlighting the validity and power of miracles. “The number one takeaway is that prayer works and love wins,” Franklin said. “Why would Joyce pray that hard [for her son]? It’s because of her love.” Breakthroughhas other positive messages, including on patience, forgiveness and reconciliation. The film will make you cry (OK, I admit it: I did) and then smile for joy. I watched it with my 11-year-old and 7-year-old kids. They enjoyed it as much as I did. Maybe they were drawn to the basketball theme (it’s John’s favorite sport) or to the film’s ties to Steph Curry (he’s an executive producer) or simply to the fact that the movie is about a child/teenager. As a parent, I was more moved by the unconditional love Joyce showed for John, as he struggles with his place in life. He’s a moody teenager who is pushing his parents away, even if he needs the love they provide. Joyce never gives up on him – before the tragedy or after. “I believe God can heal our son,” she says. It’s inspiring to watch. NEXT: 5 Things Parents Should Know about Shazam!